After it had lost the 2018 Olympic semi-final to Germany – Germany, for God’s sake – the Canadian senior men’s team went to straight to the ‘Emergency Measures: What to Do When We Lose at Hockey’ instruction manual. Most shuffled away at speed, heads down. There was battlefield stoicism from the few leaders designated to talk. A sort of Ypres look to them, staring off into the distant horizon that is renewed Canadian hockey glory. There was a wonderful theatrical quality to it – people hitting their lines on cue, understanding instinctively what was expected of them. “We let our country down today,” defenceman Mat Robinson said. Except this time, no one rushed in to console him. Everyone had already switched over to luge. Because, hey, it’s not like you lost something important – like the world juniors. “I don’t know what happened,” defenceman Chris Lee said later. I do. Canada got jobbed by the NHL in cahoots with the IOC. The Olympic squad will never again be our best team, or our 10th-best team. However heavy the maple leaf is, it’s just a team. As such, nobody puts stock in Olympic hockey any more as an indicator of our place in the world. Bronze in Pyeongchang? Sure, whatevs. Just throw it in the national junk drawer on top of all those United Nations commendations. Same goes for hockey’s world championship. Can you name last year’s winner? No, you can’t. Canada came in fourth. No one cares. The World Cup of Hockey was such a contrived bore that it couldn’t regularly fill the room in Toronto. Tickets to the final, which featured Canada, were being resold for less than face value on the day of. I could stage a one-man interpretive dance quintet on top of a mailbox at the end of my block, advertise it with a single flyer stapled to a tree in a park an hour before curtain rise and a hundred people would show up. Torontonians like going out to see things. Anything. Except the World Cup of Hockey. Which puts Canada in a weird position. We are the only one-sport country in the world (pipe down in the back) that doesn’t go bonkers for that one sport at the international level. 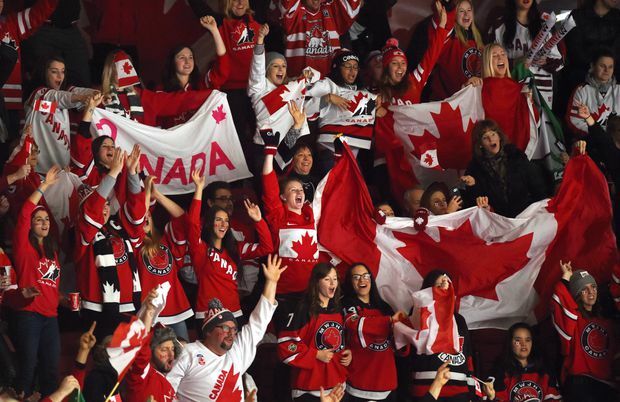 On a cultural level, the world junior hockey championships may be our most Canadian product. Weirder still, when we do care about it, it involves a bunch of spotty teenagers. The IIHF World Junior Championships start next week. This is the start of Canadian Christmas (as opposed to real Christmas). For a few days, everyone in the country knows who Canada’s best second-string university-freshman-aged goalie is. They know who made it at whose expense and, having previously heard only a few of the names involved, still have strong opinions on the topic. This year’s coverage will have its own theme song. Though we’ve got used to it, this is more than a bit odd. Take England. It cares about soccer. If you have attended an England match, you know the English care about it a scary amount. Every figure on that team is a national obsession. One great game at the right moment turns you into a hero for life. One bad one and you’re David Beckham. But England doesn’t invest itself in its feeder teams. The under-17 England squad won that age bracket’s World Cup last year. It prompted a huge national shoulder shrug. Canada treats the world juniors as both bellwether for future success and a referendum on the current state of the game. As long as our 18-year-olds are better than everyone else’s 18-year-olds, there is a widespread belief that setbacks for more senior teams are aberrations. At this point, the proposition that Canada is the best hockey country in the world is a matter of faith. No objective evidence can dissuade the faithful. When the Canadians lose, the party line is ‘Well, we could have won if we really wanted to’. The kids don’t get the same mulligan. If they lose badly, it’s a national emergency. One suspects this is down to a couple of factors that have little to do with hockey, per se. Timing is the key one. A lot of people are off during the duration of the tournament – Dec. 26 to Jan. 5 – and cooped up with family. What else are you, a patriot of convenience, going to do during that time? Talk to your relatives? I rather think not. You’ll watch hockey for 12 hours a day, which is both fun to do and gives you an excuse to tell your brother-in-law to please stop yammering about his wretched basement renovation. If the world juniors happened in March or April (such as the world championships), no one would tune in. TSN’s world-junior Amway routine – “Just come over to our house for breakfast and, sure, we are going to be showing a little hockey, but you don’t have to buy any if you don’t want to. However, it is amazing. Can the panel tell you a little about our hockey from sunup to sundown?” – is another driver of interest. TSN is a hockey network without a lot of actual hockey. So the little hockey it has, the network is determined to make a meal of. That missionary marketing zeal has resulted in a lot of conversions. A couple of years ago, Bell Media claimed that 17.2 million “individual Canadians” had watched some portion of the coverage. Essentially, if you weren’t working, you were watching. The result of a lot of spare time paired with a sustained advertising bombardment is a sort of northern cargo cult. Having been given a thing – in this case, hockey – Canadians go wild for it in the hopes that it will result in even more important hockey. But at least in this moment, that outlet doesn’t exist. There is no longer any senior international tournament that feels vital. Certainly, none with any history. So Canada retreats to the innocence of what looks like amateurism and the sport’s old-timey values. Kids doing it for love of country and the game, in that order. Having watched the world juniors go from a non-event to a national spectacular in the space of a few years is a bit strange. Piling this much pressure on teenagers can seem unfair. But, on a cultural level, the world juniors may be our most Canadian product. Though it’s put on by an international body and attended by many other nations, we alone drive its success. And just in this one instance, it’s a thing we don’t feel the need to convince others to like or understand.